Katja Kosirnik is an experienced and certified Personal Trainer, doing personal one-to-one training, personal small groups training, outdoor Bootcamps for smaller or bigger groups, for individual clients of corporates customers. Her approach combines effective training methods with inspired motivation. Katja approached me with the request of developing a custom website that she could use as her online business card. 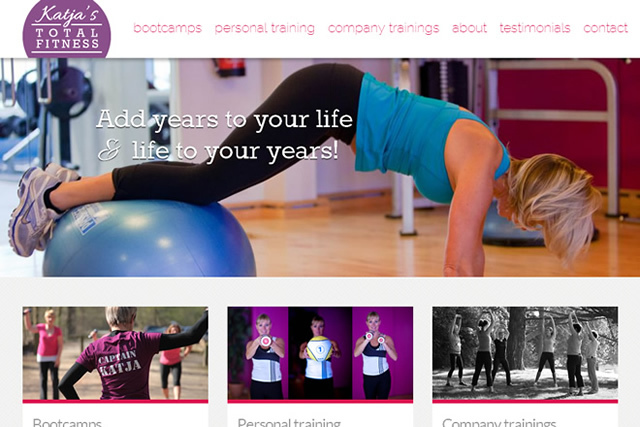 It showcases the different work-out packages for bootcamps, personal training and company trainings she offers, gives an insight in her personal background and lists a bunch of client testimonials.